"The Jazz will hold their last workout before the draft on Tuesday. One player who isn't expected to attend is JaVale McGee. The Nevada center's situation is unique to say the least. He signed with an agent who works for Eugene Parker, better known as one of the NFL's top agents. But McGee's mother is the one who's supposedly calling all the shots. Pamela McGee played on the U.S. Olympic team in 1984 as well as two years in the WNBA but apparently won't let her son work out for teams drafting outside the lottery. This even though McGee is now projected to fall to the Jazz at No. 23 by ESPN.com. Her bigger concern is said to be getting her son ready to play as a rookie than where he goes in the draft. The NBA: Where mom happens." 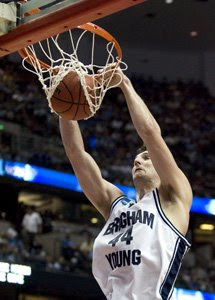 We already tried bringing in an overrated stiff from BYU - remember Hafa - and it didn't work. Please don't make us go through it again. Let's just hope our old buddy Chad Ford has this one all wrong. 00-Tag, I tend to agree with you. 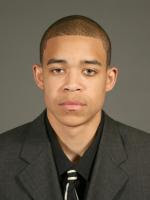 Javale McGee sounds like "bust" to me. I guess at #23 we don't have the greatest options. If McGee is invited to the draft, he may be waiting a long time to hear his name. This guy has "heartless" written all over him. In the second round don't the Jazz have to go foreign? We don't have the roster spots this year.